The Boeing Company (NYSE:BA) shares are having one of their worst runs in years following the tragic crash of Ethiopian Airlines flight 302 on March 10. It was the second Boeing 737 MAX 8 jet to crash in the last five months and has lead hundreds of MAX 8 and MAX 9 jets to be grounded worldwide. While Boeing shares are down by 14% in March and by 10% since the March 10 accident, they are still up by over 24% over the last three months and have more than doubled over the past two years. Meir Barak, founder of Tradenet, adds: “Boeing’s rise brought about some 30% of the Dow’s incredible, latest rise. It is anyone’s guess what would be the outcome of Boeing’s scandal and their ability to repair the costs, much less rebuild their reputation.” Barak’s Tradenet Day Trading Academy offers a range of courses on technical analysis and a YouTube Trading Channel where he explains some aspects of technical analysis and conducts daily live streams of his trading. Boeing had contributed 370.5 points to the Dow’s 2019 gains as of the middle of last week, more than twice as much as any other stock in the index except for Goldman Sachs Group, Inc. (NYSE:GS). Did Boeing Selloff Create a Buying Opportunity? In the days following the latest crash, some analysts suggested that The Boeing Company (NYSE:BA) stock was being unfairly beaten down. They noted that there was little information regarding what caused the accident and whether it was in fact an issue with Boeing’s planes. Those planes, which are Boeing’s newest model and have been in commercial use for less than a year, are expected to remain on the ground for weeks at a minimum. “It seems like the worst is over for Boeing, and the fact that the U.S. fleet is grounded means they have time to come up with for a fix for this,” Tim Ghriskey, chief investment strategist at Inverness Counsel told Reuters. While that development will not necessarily hurt Boeing’s results in and of itself, airlines could seek compensation from Boeing for the trouble. Air Canada and United Continental Holdings Inc (NYSE:UAL) have both warned that the grounding of their MAX jets will have a negative impact on their business. Of greater financial concern to Boeing and its investors is whether any modifications may have to be made to existing planes should it be revealed that technical issues did indeed contribute to the crashes. The company is also likely to face costly lawsuits from families of the victims if it is deemed liable for the crashes. Such a damaging revelation could also lead to customers pulling orders, which would lead to a further pullback in valuation. The MAX jets have been Boeing’s fastest-selling airliner and are the largest contributor to its top- and bottom-line performance. 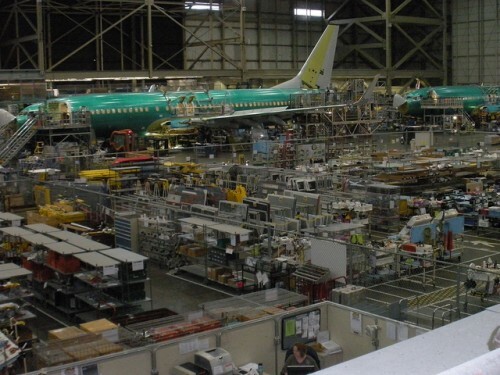 Boeing has temporarily halted the delivery of MAX jet orders, though production of the planes continues. Those answers aren’t yet conclusively known, which is why analysts have yet to downgrade their 2019 earnings estimates for the company. However, recent analysis of the Ethiopian plane’s black box has shown “clear similarities” between the Ethiopian and Indonesian crashes according to Ethiopia’s transport minister, suggesting similar technical problems may have played a role in both crashes. Both planes exhibited erratic altitude changes shortly after takeoff according to FAA satellite data, with air traffic controllers noting that the Ethiopian plane’s altitude was rapidly moving hundreds of feet up and down. Sources told Reuters that the Ethiopian plane’s stabilizer appeared to be set in a position that would cause the plane to dive. The investigation of the Indonesian crash has likewise focused on that plane’s stabilizer, which may have been incorrectly handled by an automated system in such a way that the plane would dive. Such a malfunction could be caused by faulty sensors, with the jets’ lone angle-of-attack sensor being fingered as the possible culprit in that crash. The crews of both downed planes reportedly requested to turn back shortly after takeoff. It has been reported that Ethiopian Airlines pilot Yared Getachew did so in “panicked tones” just three minutes after taking off from Addis Ababa, suggesting he was experiencing dramatic control problems. Both planes crashed shortly after, just minutes into their flights. Pilots have also complained that they were not properly trained on the autopilot system and that the operations manual was “criminally insufficient”. Boeing has stated its confidence in the safety of its newest planes, but is nonetheless working on a software update that will reportedly change how the automated system responds to incorrect sensor readings. It is also updating its pilot training program. If Boeing can convince airlines that it has addressed any technical and/or pilot training concerns, it should be able to withstand the scandal. However, that may require the company being a little more forthcoming about the issues which caused the two crashes and how they were tackled, rather than simply trying to sweep the scandal under the rug. Disclosure: None. This article is originally published at Insider Monkey. Were Hedge Funds Right About Alphabet Inc (GOOGL)? Roger Ibbotson’s Zebra Capital Management’s Return, AUM, and Holdings... Were Hedge Funds Right About Alibaba Group Holding Limited (BABA)? Was Starboard Value’s Jeffrey Smith Wrong about Newell Brands (NWL)? ValueAct Capital’s CBRE Recommendation Delivers 150% Gain Are Hedge Funds Right About Berkshire Hathaway Inc. (BRK-B)?